I always have so many scraps of tiny remnant fabric, leftover from sewing projects and whatnot. These bits might be small but they're full of colour and texture and personality - little snippets of designs I dreamt up in a notebook and turned into a real-life thing. And the texture of the fabric really shines when you've got little itty bits - the raw roughness of flax linen, the supersoft and pure white of quilting cotton and the body and texture of organic hemp. Yonks ago I made a heap of buttons and did a little tute (hello, old blog!) Back then I started out with a process that was a lot more complicated (involving sewing the fabric edges and gathering it, eek) but there's a much easier way and all it involves is buying a couple of really cheap tools, so I figured it's about time I did an updated tute. It takes no time at all to whip up a bunch of buttons yourself once you're set up, so get onto it! 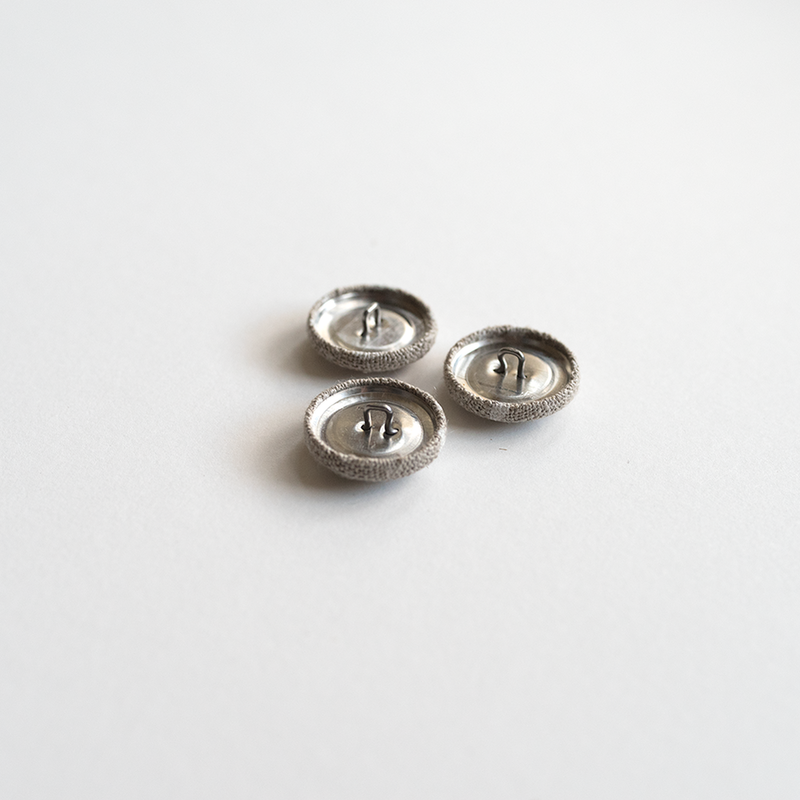 Metal self-covered buttons - shells (the front) and backs (shanks). I use the 23mm size, 7/8", which is US size 36). STEP 1: Use the circle template the cut a bunch of fabric scraps to the right size. STEP 2: Place the fabric, right side down, on top of the tool base. Then place the button, right side down, on top of the fabric, along with the blue presser tool. STEP 3: Press the button and fabric into the base. You may need to apply a bit of pressure and sometimes it's easier to turn it upside down, as per step 6. STEP 4: Smooth out any kinks in the fabric at the button edge. STEP 5: Position the button back/shank on top of the neatened fabric. STEP 6: Place the blue presser tool on top of the button back (hollow side down) and turn upside down. Press the tool base. You'll feel it click when the back is locked in place. STEP 7: Admire your handiwork! That's it! Sooo simple. Once you start making some buttons, you'll get addicted and want to make a heap. What do you do with them? I've put them on clothes, cushions, used them as decorations on gifts, used them tied into hair elastics - the possibilities are many. Or get flat backs and glue a magnet on the back and put them on your fridge. Happy crafting! Every now and then I reach *peak fabric*, ie: I end up swimming in a sea of the sceenprinted goods. This week was one of those times, so I promptly made up a whole bunch of colour-coordinated fabric packs, which are available as of today. And if you want to be the first to hear about such things in the future, make sure you sign up for the (infrequent) mailing list and get first dibs. Oh, and I also went crazy making fabric covered buttons, so all orders received in May will get some buttons thrown in, for good measure. I hope you love buttons as much as I do.